A few months ago, I decided I was tired of having to redirect our almost three-year-old son from my (then dormant, but soon to be planted) raised garden beds. He was overwhelmingly attracted to the 8' x 4' plot of dirt to the point that the area became replete with sand toys and multiple baths were required each day. So my husband took a weekend and built a 6-foot square sandbox in a small corner of our yard and I set to work sourcing sandbox sand. Let's just say he was done with his project weeks before I finished researching sand. If you've ever looked up "play sand" on the internet and followed any of the links down the various rabbit holes, then you know that it's a very slippery slope toward deciding to never let your child anywhere near a sandbox ever again with a dose of potentially prohibiting them from the beach as well. The "problem" is that in most cases, play sand is manufactured by crushing quartz, which creates a product that is a great consistency for playing and making castles; but when dry, also has a pretty severe warning to go along with the silica dust it kicks up. Depending on your source, the inhalation risk is for those using the sand in commercial applications on a long term basis (think sandblasting) and not when just playing. However, most bags of play sand carry a big, scary warning in bright red letters: THIS PRODUCT IS A KNOWN CARCINOGEN IN CALIFORNIA. Which would lead most parents to then wonder, if it's a carcinogen in California, why isn't it one here in [fill in your state] and what the heck are we doing marketing this for kid's play?! What it boils down to is that California has stricter labeling requirements than other states for children's play materials. The play sand in California is the same play sand available for sale everywhere else. 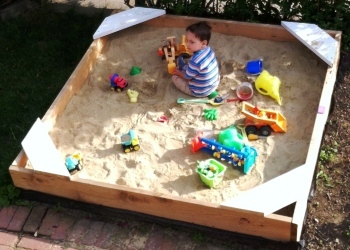 This sandbox tutorial by Dover Projects offers the how-to on building the frame, as well a lengthy sand quality and safety segment towards the bottom. A discussion forum thread re: sandbox sand options. Pea gravel as a play sand alternative -- the dialogue in the comments section is informative. Material Safety Data Sheet (MSDS) for Quickrete's play sand (the sand we selected). Ultimately, we chose to use the play sand. We have been very cognizant of the moisture level of the sand, and really, we've had so much rain that the sandbox has never been dry enough to kick up dust. And as for the beach -- well, you couldn't keep me away at this time of year no matter what the sand is made of!